I am sitting in the food court of one big mall in Surabaya. Behind me is a middle-aged man who is trying to give away brochures to passers-by. He must be one of the legislative councilman-to-be, who will be elected this April 9, 2009. Many people are trying hard to be legislative council, for the sake of self-pride. 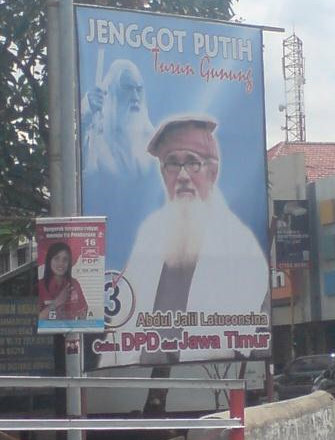 They promote themselves along the streets in every town in Indonesia. If you ever visited Indonesia these past few months, you must have seen those brochures, flags and other advertisement medias along the streets. They not just put their photos in the advertisement, but they also put someone else’s photo. Such as Gandalf! One of them is using the photo of Gandalf. I’m wondering if he ever thinks that he is as wise as Gandalf. 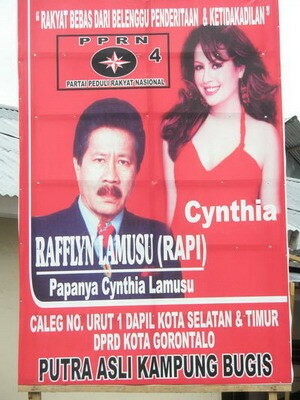 Or this man, who is happening to be a father of one famous artist in Indonesia. He puts his daughter’s photo next to him. To be honest, people will see his daughter first, then his face. So, who is eligible enough to be the councilman? Father or the daughter? One headline of the newspaper wrote that many of the councilmen-to-be have no permanent jobs. They don’t even have proper education background to be councilmen, to be elected by the community. How can they do their work effectively, if they don’t have educational background to support them? Or how can they do their work effectively if they don’t know how to be professional? So, when I watch this man at the mall, I’m wondering … does he have the qualities to be the council?